Former Leinster and Ireland star Luke Fitzgerald would risk playing Garry Ringrose this weekend for his province so he's ready for the crucial games against Scotland and England over the following two weekends. 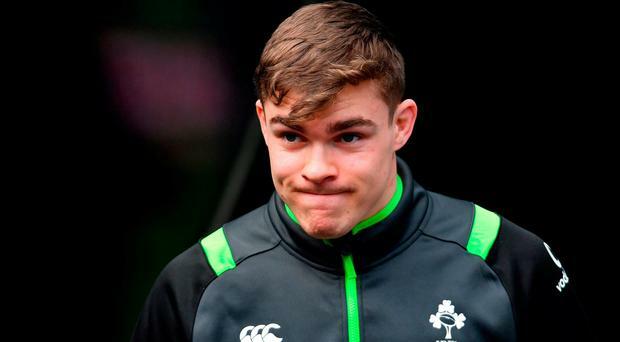 Ringrose made his return from injury last weekend in the rout of the Southern Kings but looks set to be catapulted into Ireland's starting XV after injuries to fellow centres Robbie Henshaw and Chris Farrell. Farrell twisted his knee in training yesterday and suffered ligament damage that rules him out of the remainder of the Six Nations. With doubts over his fitness, Fitzgerald told The Left Wing podcast in association with Laya Healthcare, that Ringrose needs a significant amount of game time when Leinster take on conference rivals Scarlets this weekend. It looks like a clear battle between the Leinster centre and Munster's Rory Scannell for the number 13 jersey outside Bundee Aki. "I think if you give Ringrose time this weekend then you have to give him 50-60 minutes," Fitzgerald said. "What's the point in a half, the risks far outweigh the benefits. it's only another half of rugby. "Would he be better off in camp? They train at break-neck pace anyway. "If you are going to play him because he hasn't got enough game time and I think he needs to play then you have to be comfortable enough with putting Scannell in, I would be. "I wouldn't put Garry in for a half. I think he needs to play 60-70. 50 minutes is not enough. "You need to play a full game to be match fit. "We've had a good few guys going down but I still think we look pretty strong. I mean Garry Ringrose coming in. Ringrose is a spectacular rugby player. "He's looked a little rusty this year. I would play him (this weekend)."